Twenty-one quarts by Sunday evening. Clouds had given way to slanted afternoon sun. The foamy cheers of football fans and muffled voices of commentators floated down from upstairs. Boys traipsed in to watch it, then out to play it. I canned peaches. Putting food by is about nourishment and stocking-up, to be sure. But it’s also about tending bubbly pots in your kitchen while wearing a tunic and cropped pants with bare feet as a cool breeze comes through the open window. It’s remembering your first peach-canning with your mom and sister when you were young. It’s reading the names of the farmers on the side of the produce box. It’s about shortening the chain and having a hand in what you put to your mouth. 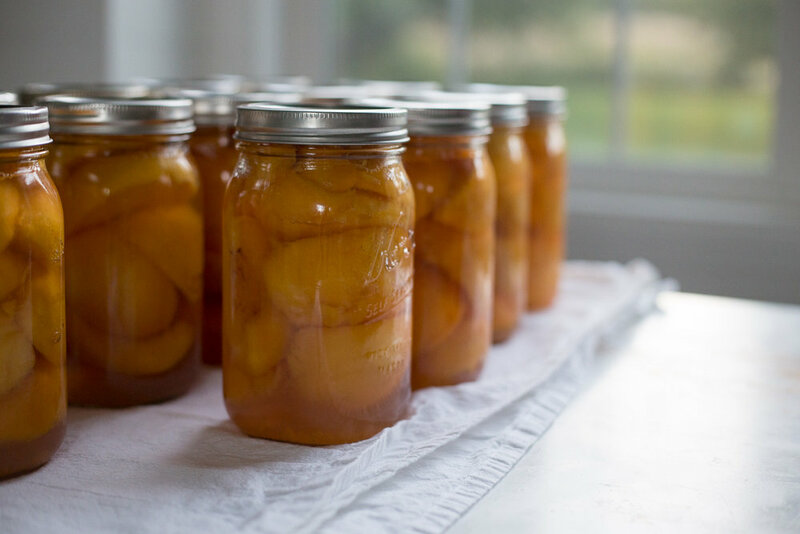 In the complicated and sometimes vexing world of commercial food production, thankfully, here’s something that’s not: peaches, water, and raw sugar, together in jars on a Sunday afternoon. If for efficiency’s sake alone, the notion to purchase all things ready-preserved from the store makes sense. With life's curent pace, the capacity of time, space, or knowledge to preserve our own may be elusive, or current priorities might direct otherwise. But here’s the beautiful, liberating thing: we don’t have to be our grandmothers, the sole provisioners and preservers of our nourishment. We have the privilege to draw from all available sources to fill our cupboards, larders, and pantry shelves. And, beautifully, we have the privilege to take a single page from grandmother’s book, if we're so inspired, and maybe preserve one thing in all its wholesome, jewel-tone glory. Four jars of raspberry jam. A half dozen of dilly beans. Jelly jars of apple butter, stacked two high. Small contributions, yet not. Provision with a capital P.
I’ve not canned all the things, but I’ve canned peaches. You need this tool and this one. All others are optional. For jars, there are a variety, from the classic to the pretty.